Cloud, mobile, and other digital technologies have made it possible to conduct business almost entirely electronically but for the last mile: digitizing traditionally analogue transactions that require paperwork and signatures. Companies eager to move faster for competitive advantage need to automate these transactions to accelerate them from days to hours or minutes. 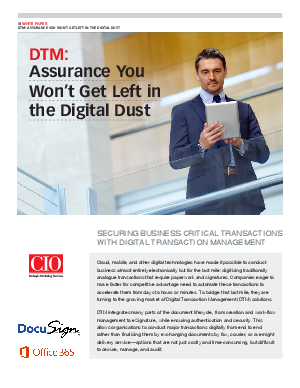 To bridge that last mile, they are turning to the growing market of Digital Transaction Management (DTM) solutions.